It has become much more convenient to snap photos using digital cameras, smartphones or other setups. However, editing those photos is often still regarded as being complicated and requiring experience, which is why Movavi Photo Editor (https://www.movavi.com/photo-editor/) is designed to make it more user-friendly. Read our Movavi Photo Editor review to find out more. Movavi Photo Editor is a simple and user-friendly photo editor that will let you edit your photos and any other images that you may wish to alter. It supports a variety of popular image formats and provides a wide range of editing tools to allow for the production of impressive images. Movavi Photo Editor is available for both Windows and Mac. 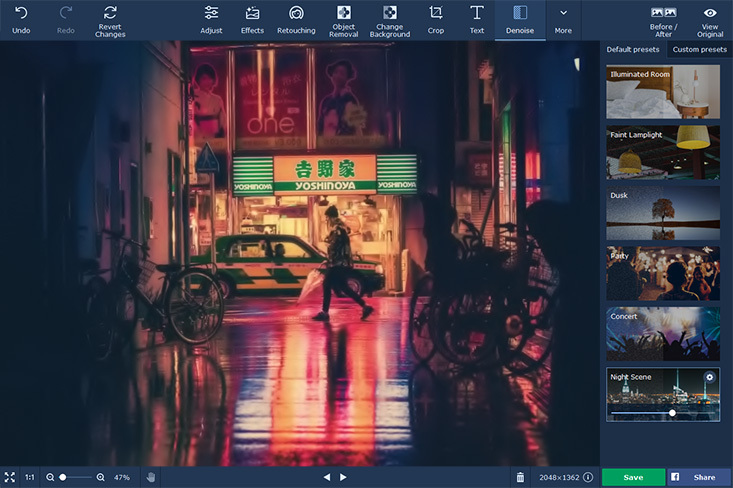 While most people may assume that a photo editor designed to be ‘simple’ is bound to be ‘basic’ and relatively light on features, Movavi Photo Editor tends to exceed expectations. It boasts a wide range of capabilities to help to process, improve, and even stylize images to a degree that is on par with even some ‘professional’ editors. With Movavi Photo Editor you can improve the overall quality of your photos by adjusting the color settings manually using sliders, or with the help of the automated tools. It will also let you improve the frame and composition, by cropping, rotating, flipping, resizing, or leveling the frame, and by removing any objects, people or other elements from the composition without leaving any traces behind. For portraits or ‘selfies’, Movavi Photo Editor has a range of specialized retouching tools that can be used to remove blemishes, smooth wrinkles, apply digital makeup, whiten teeth, alter eye colors, and much more. It is also possible to stylize any of your photos with a wide selection of filters including options like Cézanne, subdued pearl, sizzling cinnamon, nostalgic, and so on. In addition to all that there are lots of other features that may come in handy in Movavi Photo Editor such as the ability to remove or replace the background or add customizable text inscriptions. Simply put, you should be able to edit your photos in any way you require. As mentioned above, Movavi Photo Editor is designed to be intuitive and user-friendly, and that is reflected in both its user interface and features. The user interface is clean, modern-looking and organizes all the features that are available into descriptive tabs that are easy to browse. Similarly, the features themselves are designed to be easy to apply, often requiring just a few clicks or some basic actions such as dragging and dropping elements or adjusting sliders. In some cases they are automated, to make editing your photos even easier. If you’re looking for a photo editor that has powerful features and yet doesn’t require a steep learning curve or any prior experience, Movavi Photo Editor should be a good fit. The features that it provides will more than suffice for most of your needs, and should allow you to improve any of your images and create impressive photos of your own. Movavi Photo Editor is available for Windows and Mac. You can download a free trial version here. The full version costs $39.95. We hope you found our Movavi Photo Editor review useful. If you have any questions about this software, let us know in your comments.